Richard Mildmay Foot was born 8th October 1865, the third son of Sophia Maria and the Reverend Cunningham Noel Foot the rector of Dogmersfield, Hampshire. He entered the Army and was educated at Sandhurst. In 1885 he was commissioned into the Royal Inniskilling Fusiliers. He served with this Regiment, firstly in Zululand, from 1887 – 1888 and then in the South African War 1889 – 1902. He was the central figure in an incident that was reported in a poplar picture magazine of the time. During an attack on the Tugela Heights he was wounded in the head and lay within sight and sound of the Boer trenches. They called for him to surrender to which his reply was “ No I’ll die first”. A party from his own Regiment eventually rescued him during a later assault. Promoted to Brigade Major he then became a Deputy Assistant to the Adjutant General. For his service in South Africa he received the Queen’s Medal (3 clasps) and the King’s Medal (2 clasps). Retiring from the regular army with the rank of Major, he joined the Territorial Army and was appointed to command the 4th East Anglian Brigade, Royal Field Artillery. This included two Hertfordshire Batteries whose headquarters were located, respectively, at Watford and Hemel Hempstead. 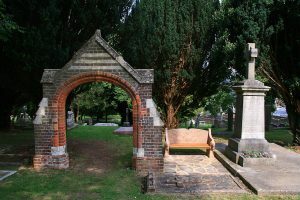 This renewed some of his local acquaintances because for a short time before the South African War he had been Adjutant to the Hertfordshire and Bedfordshire Regiment, during which time he had lived in Berkhamsted. With the outbreak of the First World War he returned to the colours and was appointed Assistant Adjutant and Quarter Master General of the 47th (2nd London) Division. As a capable organiser he equipped the Division for war and accompanied it to France in 1915. He later served with the 62nd Division and was appointed Adjutant and Quarter Master General to the 2nd Army Corps. Before the end of the conflict he was again wounded and mentioned in Despatches five times. For his service in the Great War he received a Distinguished Service Order, a Belgian Croix de Guerre and Order of Leopold, a French Croix de Guerre and was made a Companion of the Bath and a Companion of the Order of St Michael and St George. He married firstly Frances Sophie Daniel daughter of the Reverend Lindsey Daniel and they had two children, a son R C Foot, and a daughter, Mrs Lindsey Huxley. On Easter Sunday 30th March 1902 in Cape Town, South Africa, he married his second wife, Miss Lucie Anne Cooper, the eldest daughter of Sir Richard Powell Cooper, of Shenstone Court, Lichfield. They had met when he had previously lived in Berkhamsted before he had served with his Regiment in the South African War. On his return from the Boer War “The General”, as he was soon affectionately known by all, took up residence in Whitehill, a large house (since demolished) near Berkhamsted Castle, where he and his wife lived until their respective deaths. He joined the Berkhamsted firm of William Cooper and Nephews, being appointed the Estates Manager and being responsible for the control of the large estates in Britain, South Africa, Australia and South America. When the business converted to a Limited Company he joined the Board of Directors, becoming vice-chairman of the amalgamated companies known as Cooper, McDougall and Robertson Ltd., and he was also Chairman of the Trustees of the Cooper Pension Fund, positions that he held until retiring in October 1931. He was active in other spheres of Public life including being Deputy Lieutenant of the County of Hertfordshire, a member of the Hertfordshire Territorial Army Association and a magistrate for the Berkhamsted Petty Sessions. His local interests included being a Governor of Berkhamsted School and of Berkhamsted Girls School, President of the local British Legion, the Berkhamsted Boy Scouts Association and Chairman of the Berkhamsted and Northchurch Nursing Association. He was also one of the Tax Commissioners for the Dacorum Division. Throughout his life he owned gun dogs, his first being a Pointer when he was in Zululand. He regularly hunted foxes but he was obliged to give up horse riding after the Great War due to the wounds that he had suffered on active service. However to compensate he took to breeding Irish Setters which he began in 1926. He joined the Kennel Club in 1927 and chose the kennel name of Beorcham for his particular blood line. This name was still listed in the Kennel Club Directory of Names 2006/2007. He bred the animals both for showing and for field trials. In this, like all of his enterprises, he was very successful winning many championships for the breed. He was elected a member of the General Committee of the Kennel Club at their Annual General Meeting held on the 3rd March 1933, but by this time his health was deteriorating. Brigadier General Foot died at his Whitehill home on the 16th October 1933, aged 68 years. A memorial service took place at the parish church of St Peter’s, on Wednesday 18th October, and was conducted by the rector Canon Chipchase Stainsby with the assistance of the Reverend C T T Wood (vicar of Tring and the General’s Chaplain in France during the Great War). There was a large congregation of mourners including family and people representing the many organisations with which the General had been connected. At the end of the service “the Last Post” and “Reveille” were sounded by buglers of the 27th Inniskilling Fusiliers. His body was then interred in the parish graveyard in Three Close Lane in a private ceremony. His wife continued to live at Whitehill dying suddenly on the 20th September 1946 in a London nursing home, after a minor operation. She had spent much of her life in an interesting career in agriculture and is buried with her husband.